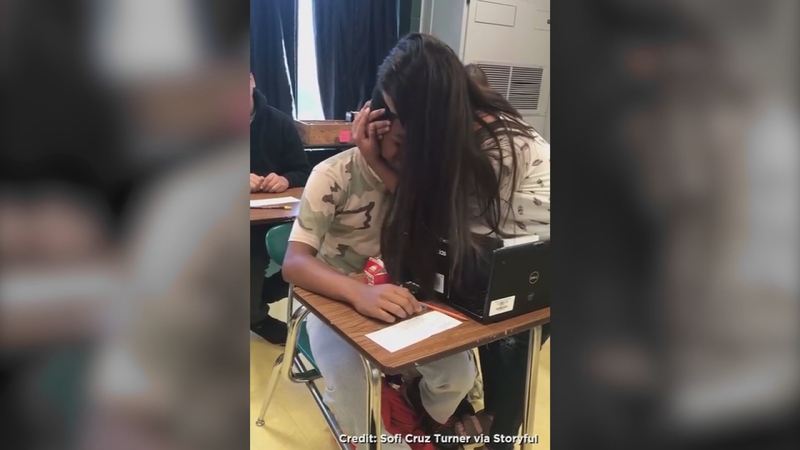 SOUTH CAROLINA -- A South Carolina teenager reacted with tears when his long-time classmate and friend, Sofi Cruz Turner, gave him a new pair of shoes and other items as a gesture of appreciation for his years of friendship. This video shows the moment Sofi gave the new shoes, shirts, socks and a backpack to Jahiem during class and Jahiem's emotional response. "The past week and a half, I have been planning on doing something special for a good friend of mine. His name is Jahiem. I have known Jahiem since the third grade in Mrs. Dragotta's class. He has always been that one student where he does all of his work when due, never misses school, always helping the teacher out with stuff in class, and always being a happy human being." The previous week, Jahiem had asked if someone could buy him a new pair of shoes, while not wanting "to sound in need," Sofi said. She wrote that she had always wanted to get Jahiem a gift, but either didn't have "the money or the gut to do it." However, she said that after getting a job and saving money, she decided to buy him shoes the next day. "When giving him his stuff and watching him open his bag, all my emotions were coming out," Sofi continued. "Seeing him crying was very emotional because I could see that he-- didn't know what to think. I am so thankful to know that giving Jahiem those shoes made him so happy and allowing me to realize that giving someone something so special can be life-changing."